Seated or Standing Desk – Which Works for You? Many adults sit at a desk for around 7 to 10 hours each day. This may be because of work but it can also be down to lifestyle choices as many children and adults spend their spare time in front of screens. The good news is that there is an alternative to sitting all day. Desks have evolved and now it’s possible to use a standing desk for work and for play. However, you may be unsure as to which type of desk is best for you. Let’s look at the pros and cons of both seated or standing desks. The main advantage of seated desks is that standing for extended periods of time isn’t something everyone is capable of. There are sometimes underlying health problems that prevent standing for a long time, such as orthopaedic issues. A seated desk is practical for anyone who finds relief when sitting down. The other pro to consider is for people who need to have precision control over their work, such as graphic designers. While this type of precisions isn’t always required, there will be time when seating provides a lot more control for the user. We have touched upon the most serious disadvantages of using seated desks above. Prolonged periods of sitting down can cause issues with weight and obesity, lead to type 2 diabetes and even cause cancer. Sitting down for many hours can cause significant health risks and even lower life expectancy. Standing desks are desks that are positioned higher than more traditional desks. Your monitor is raised up and a lower desk area is perfectly positioned for your keyboard, mouse, telephone and other essential items. Standing while working reduces the health risks, you burn more calories and has been shown to improve concentration too. Switching to a standing desk can be hard for many people. Foot pain and leg fatigue are common complaints that are experienced with new users. Another problem can be that fellow workers find colleagues standing up to work to be a distraction, at least in the early stages. Which is Best? 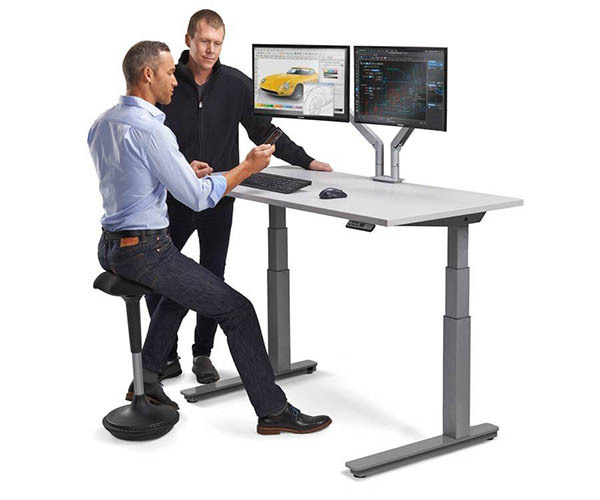 Seated or Standing Desks? There isn’t a simple answer to this question as everyone is different. However, there is a good argument for combining both and using a desk that can be quickly converted between the two options. Begin by standing up for 20-minute periods to help the body adjust to the new working method. Gradually lengthen the standing periods but remember to take a seat to provide rest for your feet and legs on a regular basis.